Soil is an important and complex part of our environment. The agro-ecosystem is made up of many interacting components with multiple goals. Soil quality is one important part of sustainable agro-ecosystem management, analogous to water and air quality. 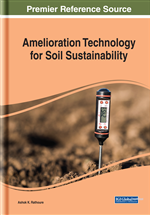 Assessing soil quality may help managers identify practices that could be adapted to become more sustainable. Soil quality is the ability of a soil to perform functions that are essential to people and the environment. Soil quality is not limited to agricultural soils, although most soil quality work has been done in agricultural systems. Soil quality definitions emphasize several features. Dynamic properties include organic matter, soil structure, infiltration rate, bulk density, and water and nutrient holding capacity. Changes in dynamic properties depend both on land management practices and the inherent properties of the soil. Here, the author has presented for intrinsic and vigorous properties, soil structures and macrophores, soil quality management, etc. Time (time that parent material is subject to soil formation processes).